Most communities in Judea and Samaria are beautiful towns filled with regular people — people who have responsibilities, hopes, and dreams, just like you. Children to nurture, jobs to work, dishes and laundry that never ends. There are a few differences though between your life and theirs; they are living in the mountains of Biblical Israel. When they walk out their front door, every morning, they are standing in the very places that our Biblical heroes lived and walked! Every time they wash their dishes or hang laundry on their clothesline they are fulfilling God’s commandment to possess the land. Every child they raise is one more link in the unbroken promise God spoke to Abraham that this land would be their everlasting inheritance. Communication is vital in an emergency! Despite constant threats from enemies that surround them, life goes on in the everyday ebb and flow of normal schedules. Unfortunately, terror attacks are a reality for those living in Israel. Israelis cannot afford to take their security for granted and they are on constant alert for any possible threat. They work hard to overcome their fear, to live with their fear, never allowing fear to rule their lives, never allowing the threat to stop them from living a life filled with purpose and meaning. This is especially true for the community of Migdal Oz. Despite their location just a few yards from an often hostile Arab village, thankfully, they haven’t experienced the horrific terror attacks that other communities have suffered. But that doesn’t mean that they can relax their vigilance. All a terrorist needs is one opportunity. So the people of Migdal Oz are constantly on guard and keeping watch. 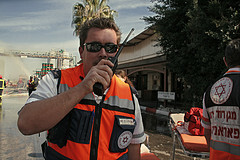 Migdal Oz, like all other communities in Judea and Samaria, has a dedicated security team and a group of Rapid Response volunteers. These volunteers are trained in basic security guidelines and first aid and are on call night and day in the event of an emergency. One of the specific challenges that Migdal Oz faces relates to its topography. They are located in the mountainous region of Gush Etzion just south of Jerusalem. This terrain makes it difficult for normal cellular phone service to reach every part of the community. In the event of an emergency or (God forbid) a terror attack, it is imperative that emergency personnel can communicate with one another. These special walkie-talkies provide a direct communication link to the main security headquarters for every volunteer and emergency worker. Should there be a house fire, a car accident, or any emergency situation, the emergency personnel need to know where to go to give aid, and they need to be able to call for help. Can you imagine their frustration watching a house burn down and not being able to reach the main fire department because they can’t get a signal on their cell phone? This is exactly why Migdal Oz is asking for your help. 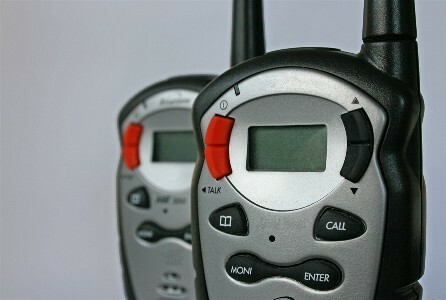 Your donation today will help them purchase walkie-talkies that do not use cellular service. These special walkie-talkies provide a direct communication link to the main security headquarters for every volunteer and emergency worker. Being able to communicate effectively in an emergency situation will save lives! Your donation today will give everyone living in Migdal Oz peace of mind, knowing that their Rapid Response Team is equipped to handle any crisis situation, at any time, day or night.